This entry was posted on January 30, 2012 by Sawdizzle. It was filed under Food & Recipes and was tagged with bagel chips, bagels, easy snacks, food, gardetto's, garlic, garlic chips, homemade, how to make, how to make rye chips, how-to, olive oil, onion, recipe, recipes, roasted garlic rye chips, rye, rye chips, season salt, snacks, trans fats. I never thought of just cutting up rye bagels…ingenious!!! 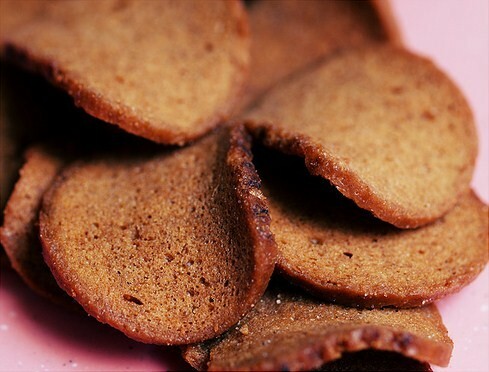 However, I think the Chex Mix variety uses worcestershire sauce, so I’ll have to amend your version and see what I come up with…thanks for the great post!!! Don’t forget to give the almighty internet some credit, haha. 😀 I like the idea of worcestershire sauce; let us know how that turns out! I loves these but I live in Britain and can’t readily get a hold of rye bagels. 😦 I had to import seasoned salt. It’s really, really easy to make seasoning salt at home. It’s basically a glorified mix of seasonings that most people have on hand on the spice rack. Here’s a link to a recipe for those of you who want to make these from scratch. Gardetto’s contains 300mg of cholesterol. Does this recipe guarantee 0%? I guess it’s great fun to procure and carefully slice rye bagels, but as Aaron said, the bag of actual Gardetto’s Rye Chips I got at ye olde Walmart has 0% trans fat, 0% saturated fat, and even 0% cholesterol (unsurprising as no animal fats are used, only soybean oil and a scant amount of canola oil). Now if only they could magically make them calorie-free, this would be the perfect snack! So basically, you found a recipe on the internet, re-wrote it, took a picture of actual gardettos(or took one from google) and posted it saying “I’m going to make these soon” lol. Trans fats aren’t even bad for you if you have a balanced diet, get exercise and don’t over-do them. Also, the amount of seasoning you posted is no where near enough to use for 6 bagels. You can get between 20-30 chips per one bagel so around 100-130 chips depending on how them you slice them. (I like them thin) I tripled everything but the oil. I believe I used around 4 tablespoons oil brushing them. I also baked them for about an hour using my pizza pan that has tons of little holes in the bottom of the pan. Turned out really good. You can also put them in a sealed container inside the fridge If you want to make a huge batch. Easily can last a month like that. These go extremely well if broke into small pieces and put on salads or baked potatoes as an alternative to bacon bits.